KIS Homeschool is committed to understanding your child's unique educational needs and providing you with personal service as you progress through the admissions process. As the admissions process begins, families will work with the admissions coordinator who will learn about your child's special needs​, current academic levels and academic goals. They will also answer any questions that you may have. KIS H​omeschool offers rolling admissions, which means that parents may begin the enrollment process at any time and start teaching their children immediately after successful admission to the school. Parents are expected to commit to teaching their children for a full school year. As all ​of the students who attend KIS Homeschool are special needs students, they tend to fall behind their more typical peers. As a result our school year is a 12 month school year thereby providing our students with the opportunity to keep learning. Due to the special nature of the services we provide, the number of trained teachers who can provide support and guidance is limited. As a result, we are currently forced to limit the number of students who can enroll to 50 students. Students who are not accepted immediately, will be placed on a wait list and once additional teaching staff have been trained will be accepted according to their priority on the list. Families complete the admissions application form and pay the application ﻿﻿﻿﻿fee. Families are assigned an admissions coordinator to guide them through the admissions process. Parents submit all the pertinent educational documentation as well as the relevant evaluations of their child. 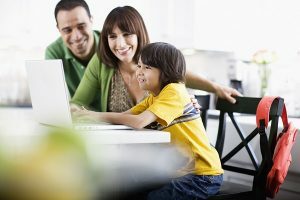 After reviewing the documentation, a KIS Homeschool academic team member will evaluate the student's appropriateness for the online home-school. Depending on slots available, the student will then be offered a place or placed on the wait list. Once tuition payment and a signed Enrollment Agreement form have been received, a welcome email is sent to the family, teachers are assigned to the student and parents. Parents can enroll in the next available training course or any one of their choosing. While doing their training, parents will complete the student's profile and supply the appropriate photos to the academic adviser. As part of the parent's training, parents will be given access to the apps and they can begin learning how to teach their children.